One of many diamond floral brooches in The Queen’s jewel vault, this diamond rosette brooch features a diamond center surrounded by two sets of petals, five petals to each layer. In shape and color it resembles the White Rose of York, the heraldic symbol that was combined with the Red Rose of Lancaster to create the Tudor rose emblem (hence the name I have used here for the brooch). 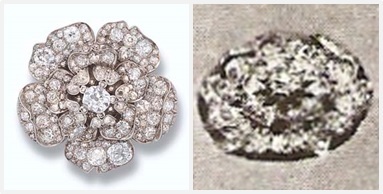 While the exact provenance of this brooch is unconfirmed, an heirloom from Queen Mary seems likely. The wedding gifts from Mary’s 1893 marriage to the future George V included two diamond brooches (as noted by Royal Magazin): one from the bridegroom, and one from the West Yorkshire Regiment. Since the bride's new title was The Duchess of York, these ties make sense. There are more than two possible rose brooches seen on later members of the royal family that could be Mary’s wedding gifts – or, of course, from other sources or from later in Mary’s life. With such possible symbolism and such a simple floral design to start, it’s no surprise that multiple examples exist. In addition to the brooch worn by The Queen, a York rose brooch was among the jewels auctioned from the estate of the late Princess Margaret in 2006. A diamond rose brooch was also included among the jewels given from Queen Mary to the future Queen Elizabeth The Queen Mother as a wedding gift in 1923; Lady Elizabeth Bowes-Lyon was also titled The Duchess of York at the beginning of her marriage. The Queen Mother’s brooch is thought to match one worn today by The Duchess of Cornwall. There is also a five petal diamond flower used as a clasp on Queen Mary's Pearl and Diamond Floral Bracelet now worn by The Queen. Whatever its provenance, this pretty brooch is a rare one to see on The Queen. She has others of similar theme and shape, such as the Nizam of Hyderabad Rose Brooches and the Cartier Diamond Rose Clip Brooch, as well as many other brooches to pick from in the diamond floral category. With thanks to Franck for the 2004 appearance. Place Your Bets in the 2017 Ascot Brooch Stakes!